MCT Box are moulded in polycarbonate and are therefore strong as well as autoclavable. One size can hold 64 MCTs of 1.5 ml. & the other can hold 100 MCT's of 0.5 ml.. These boxes are designed to work at temperatures ranging from -190C 0to +121C. The transparent cover provides a good view of the contents inside & is numbered for better inventory control. 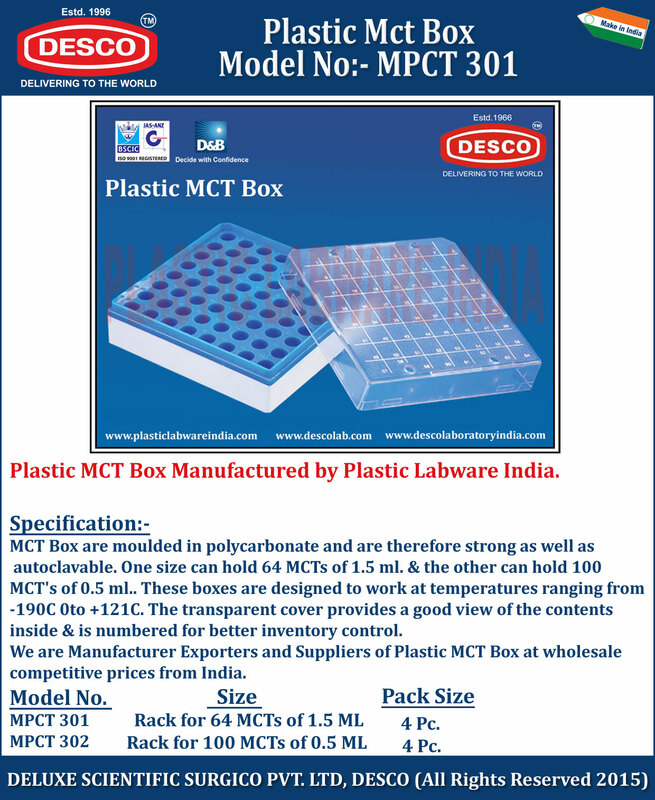 We are Manufacturer Exporters and Suppliers of Plastic MCT Box at wholesale competitive prices from India. MPCT 301 Rack for 64 MCTs of 1.5 ML 4 Pc. MPCT 302 Rack for 100 MCTs of 0.5 ML 4 Pc.